Why not join the many happy customers New Zealand wide using this tried and tested product. Money back guarantee if you are not satisfied. Have you ever wondered about the chemicals in your flea treatments? According to research chemicals in flea treatments have caused serious health problems in animals tested in laboratories. Some of these reactions include; vomiting, diarrhea, trembling, seizures, and respiratory problems. So we mustn't get it on our skin, but its ok to put it onto our precious dogs skin, and it remains in their system for a month or more? Does this make sense? Fipronil is a chemical used widely now in flea treatments. It is stored in the sebaceous (oil) glands from which it is slowly released onto the hair and skin. We encourage our customers to do their own research on products they are using to be able to make well informed decisions. Personally, as a rule of thumb - we would not want to put ANYTHING on our pet that we cannot put on ourselves - we are made of the same stuff!!!! And, along the lines of that same reasoning, as far as the testing of our product goes - each ingredient is a natural, safe, substance which has been in use for as long as trees have been producing leaves - provided by nature itself. Products containing toxic chemicals have to be tested for safety - to see how much can be used "safely". My feeling is, that if it is toxic, maybe none is a better option if there is a choice. We, along with others who are also making excellent natural alternatives, aim to provide that choice. Flea Flummox is not a new product, it has been used successfully for over 9 years now, and the growing number of happy customers speaks for itself. Flea Flummox is topical so is not stored in the animals system. Our natural alternative is very effective as the active ingredients are not toxic to your dog, but have a devastating effect on fleas. So, for it to be effective, you do need to use it regularly. We have seen fleas that get a "wiff" of the product (not even in direct contact) stagger, and fall off. The odor scrambles the brain function of the fleas. You can safely use this product as needed. 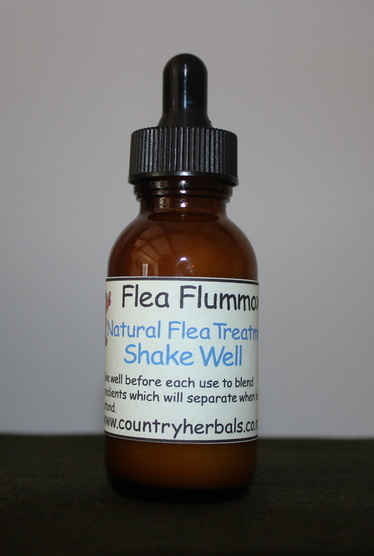 Our Flea Flummox contains distilled water, chitosan, derived from shrimp/crab shell, which forms a low allergenic, antimicrobial gel base, our blend of ten herbs and essential oils, and extracts of cedar wood and neem. The advantage of this product is it does not have a menthol smell that often dogs have a distinct dislike to. Our dog sits and wags her tail when we bring it out! Customers have happily reported that their animals don't run and hide! We have had great success with Flea Flummox for our hens legs, when they have had scaly mites on their feet and legs, and also on the cere (the bit above) our budgies beak. Just the tiniest amount pressed in, (so it looks wet) and the growth went down straight away. I put one drop on hard surface, then dipped the tip of my finger in so it was the smallest possible amount used. Can it be used on Cats? - please read this portion before buying for cats. My personal experience: I used this product on my pedigree kittens (couple of drops on back of neck) at 4 weeks without problems. I was hesitant at first, but then reasoned that the standard treatment recommended by the cat breeders, was to use the chemical drops, and I decided this couldn't possibly be as toxic for the mum or babies as the chemicals! There were fleas running round on the kittens, and after the first application they were gone. I was skeptical about it working, knowing the mother is constantly licking them, but the results were clear, the fleas were gone, and also I was vigilant to check the litter box for any sign of "runs" and there was none. (Please contact us if you are interested in selling Flea Flummox - we can send you our wholesale price list).